The film I made with Catherine Falkner during a residency at Black Bag Media Collective in St John's, Newfoundland is now in distribution with VIVO media arts, and the first screening from this relationship is happening at CineEco environmental film festival in Portugal in October (or as they say in Portugal, "outubro"! The film, a surrealist propaganda movie against the spraying of Tordon 101 on Newfoundland's highways, will show this week in Seia, Portugal in competition with other shorts. Seeking short SF films for VCON screening in Vancouver! SEEKING SHORT SCIENCE-FICTION & FANTASY FILMS for a 1-hour program at VCON SF & F convention October 4-6 2013 in Vancouver, BC. Deadline for submissions is August 5. Do you have a short SF&F film, a good standalone excerpt, or a fantastic trailer that we could show? The definition of Science Fiction and Fantasy is quite broad - so give it a shot! Vancouver-made films will be given priority. VCON HAS A PIRATE THEME THIS YEAR! But that isn't necessary for your film to be included. It would be cool, though. Arrrr. At the convention, screening organizer Flick Harrison will also do a reading from his unpublished SF novel, HOME IS IN THE HARD DRIVE - but that is a separate event. The program may tour if there is support for it from other cons. For instance, over at the Something Collective blog for our community project at Renfrew, this is what I've been up to: gathering info from the board of directors for our community mapping project. Renfrew’s Board Maps their community | Our Footprint @ Renfrew. 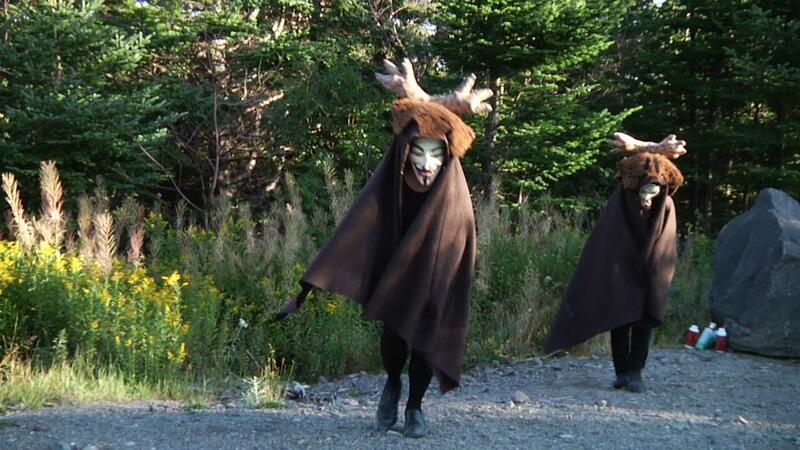 Signal Out: Remote Artist Talk from Newfoundland! So without much more than a crashed Macbook to slow us down, Something Collective's first presentation of "Signal Out" went off great. Liz Solo and the Black Bag Media Collective presented Flick Harrison's films in St John's, Newfoundland while we showed Liz's music-video and machinima work here at our studio at Moberly Cultural Centre. After the screenings, we did live Skype chats so the audience could Q & A. I spoke a lot about Final Cut Pro vs Adobe software and the future of independent video editing. Liz, for her part, talked about Second Life and the combination of joy and horror she feels in that phantasmagoric shopping mall. Liz got to bed VERY late - the time difference is 4.5 hours - and a good time was had by all, at both ends of this giant country. Here's a video promo I made several months ago for FUTURISTI, Bella Luna's re-mount of the 1920's Italian futursit scripts.